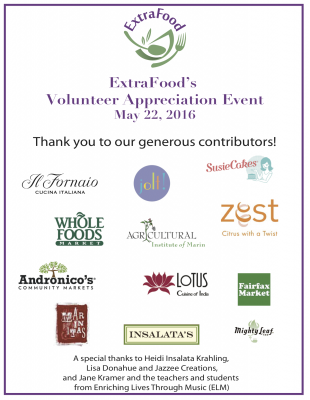 Held once again at Homeward Bound of Marin's beautiful Key Room, ExtraFood's annual Volunteer Appreciation Event celebrated our amazing volunteers, now 160 strong! Check out these photos taken by the very talented Todd Pickering. And check out this 4-minute video, created by ExtraFood Operations Manager Extraordinaire Kathy Carver and her husband, ExtraFood volunteer George Carver, thanking our volunteers! ExtraFood food recipient Enriching Lives through Music, a nonprofit that provides a free music program for children from San Rafael's Canal district, gave an inspiring performance as a thank-you for our volunteers. ExtraFood Founder Marv Zauderer (center) introduces Miguel Villareal (right), Director of Food and Nutritional Services at the Novato Unified School District (an ExtraFood food donor), to volunteer Dodi. Mary Mendoza (left) of ExtraFood food recipient Martinelli House, a Mercy Housing senior living facility, enjoys the amazing food donated by Il Fornaio, joined by ExtraFood volunteers Curt (far right) and Leah (second from right) and Curt's wife, Julie. Chef Luis of Homeward Bound took on ExtraFood's "Chef Challenge": make something delicious from food we recovered that day from the Civic Center farmers' market and Nugget Market in Novato. He certainly did! And we lucky attendees got to devour it. ExtraFood volunteers Sarah and Dan are two of the many volunteers on our teams at several of Marin's farmers' markets. Volunteers collect and sort fresh produce from the generous vendors and deliver it to our recipient partners. ExtraFood volunteer Jeff was one of the many lucky volunteers to win prizes at the event, courtesy of our generous event sponsors (see below). Marv joins ExtraFood's Operations Manager and the event's leader, Kathy Carver (third from left) and her fabulous Event Committee: volunteers Deborah (far left), Kamala (second from left), Lisa (second from right) and Ellen (far right).